The Knights of Columbus is a fraternal service organization of men, founded under the principles of charity, unity, fraternity, and patriotism. This organization provides men with a vehicle for building up the parish community and family life with an emphasis on family, youth, church, council, and community activities. Knights of Columbus Chesterton Council #1995 council chambers, is located at Seven Dolors Catholic Church, in Millerville, Minnesota. The council presently serves the parishes of Our Lady of the Lake, St Anns, Seven Dolors, Sacred Heart, St Olaf, St Edwards, and St. Williams. 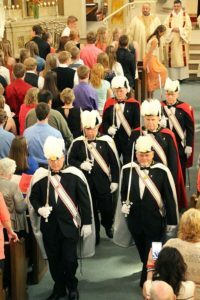 Each Knight has the responsibility to carry forward the activities of the council to his home parish. The mission of the council is to be of service to each of the communities and its members, recognizing those who are in need of support and help, providing community activities, and working with the youth. The Knights take an active role in the support of the parish, recognize the role of the clergy, help to maintain buildings, and providing leadership within the Christian community. We meet the second Tuesday of each month, at the council chambers in Millerville. If any man would like to join, they can contact any brother knight, or any officer. Please see calendar for events and meetings.